Here are some links to my books and other resources that you might like! The Gene Smart Diet is going to challenge all that you know about the relationship between genetics, weight gain, and disease risk. In the process, it’s going to change your health and your life, for the better. Trying to get heal thy can seem overwhelming and complicated. Eat carbs…don’t eat carbs. Eat fish…don’t eat fish. Pay attention to calories…don’t pay attention to calories. All this conflicting information can be daunting and confusing. Use this Participant Guide along with the Made to Crave Action Plan DVD (sold separately), to further encourage group discussion, document your personal journey toward healthy living, and to reference the quick healthy living tips that will help make your journey a success. Download Gene Smart’s Healthy Eating Guide created by Dr. Ski Chilton! Protect yourself against our country’s most alarming health crisis. 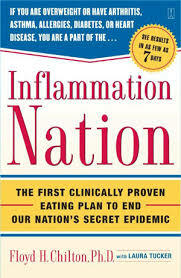 Backed by twenty years of research, and by an unprecedented six clinical trials, Dr. Chilton’s anti-inflammatory regimen is a must-have for the nearly 100 million Americans diagnosed with an inflammatory disorder and for the rest of us who must protect ourselves from this growing health crisis.